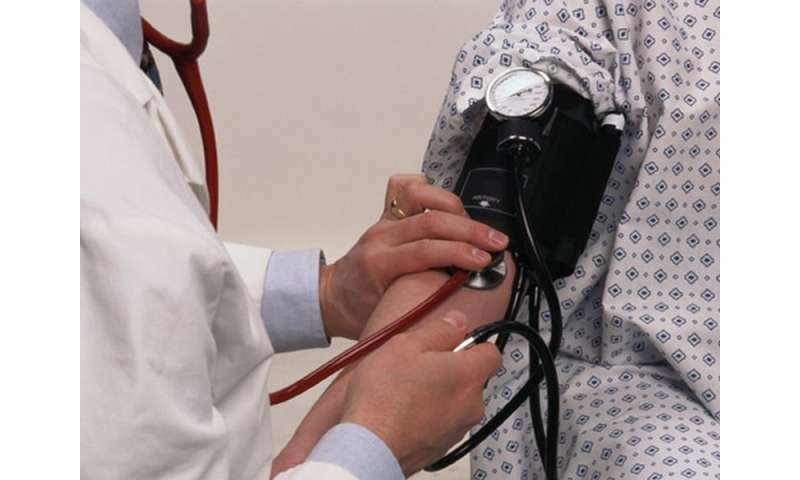 (HealthDay)—After systolic blood pressure (BP) reaches 120 to 125 mm Hg, it increases at a relatively rapid rate toward overt hypertension, according to a study published online March 21 in JAMA Cardiology. Teemu J. Niiranen, M.D., from Boston University, and colleagues used data from the Framingham Original Cohort (1,252 participants; 63.1 percent women) to identify a common threshold level above which BP rise tends to accelerate in progression toward hypertension. The researchers found that individuals maintained a relatively stable resting systolic BP level before hypertension onset. Systolic BP level began rising more rapidly after reaching a level of 123.2 mm Hg in people with onset at 40 to 49 years, 122 mm Hg in those with onset between 50 and 59 years, 124.9 mm Hg in those with onset between 60 and 69 years, and 120.5 mm Hg in those with onset between 70 and 79 years (P = 0.29 for between-group heterogeneity). "A resting systolic BP that chronically exceeds the range of approximately 120 to 125 mm Hg may represent an important threshold of underlying vascular remodeling and signal incipient hypertension irrespective of age," the authors write.